Powered by a choice of four- and six-cylinder engines, the Hyundai Santa Fe combines transparent and secure handling with modern looks and space for up to five passengers. 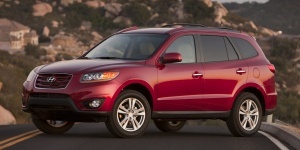 The 2010 Hyundai Santa Fe gets fresh styling, new engines, and the latest navigation technology. Inside, there have been refinements to the leather and cloth seating surfaces. Bluetooth and steering-wheel audio controls are standard on all models, while Limited models receive a standard CleanAir ionizer. Find the used Hyundai Santa Fe of your choice from a dealer in your area. Search our used car listings now.